Montreal F1 Race: They just love cancelling this thing! 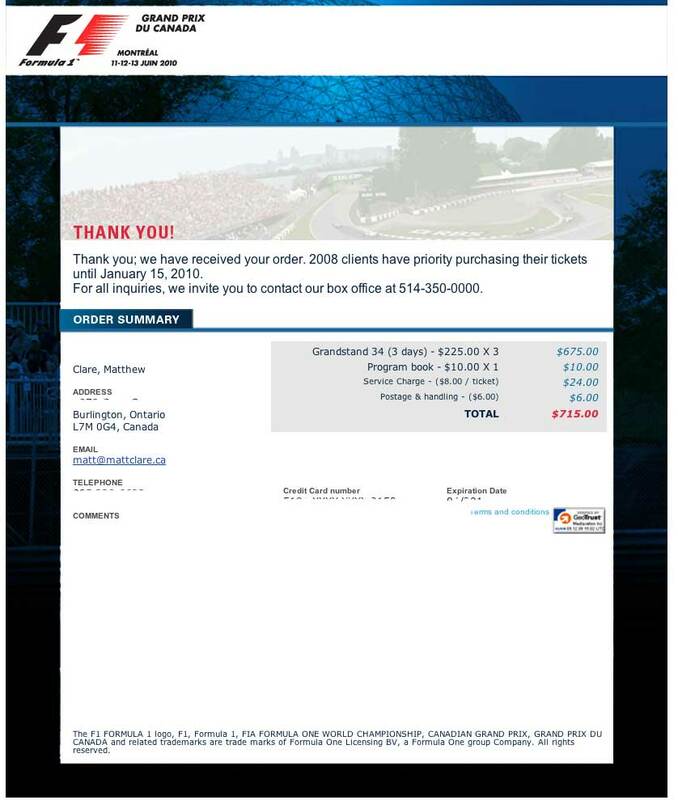 On January 3 2010, with much excitement, I ordered three tickets to the Formula 1 race in Montreal this June. I gave www.circuitgillesvilleneuve.ca / www.admission.com my billing information and bought three seats (and a program). My friends and I were excited that we got great seats in grandstand 34 in middle of Montreal’s best corner “the hairpin”. 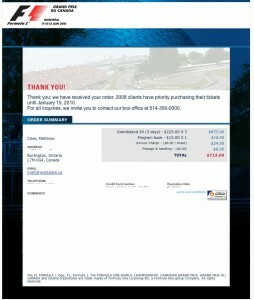 “.. you filled an order form for seats in grandstand 34 or 11 in regard of this yearâ€™s F1 race in Montreal. I filled out a web page, it only took me about a minute, I’m pretty sure they didn’t run out of seats in that minute. The E-Mail confirmation they sent me seemed pretty sure that there weren’t any problems. I’m left curious when in those 25 days did they run out of seats? Did it happen sometime in the next 24 hours and it took them 24 days to contact me, or realize that they ran out? Did they run out today and it took them 24 days to process my order? I called within 15 minutes of getting the unconfirmation E-Mail and made sure that my Master Card had yet to be billed for the rescinded tickets and then bought a “new” set of tickets at grandstand 34 – where we’ve been before – but I can’t help but feel misled and disappointed. If you are thinking of buying tickets to for the F1 race in Montreal I’d recommend dealing with a broker or just watching the race from home. It’s the only way you can predict where you’ll be this June. Apparently this is the going to be the year of 3D TV, with Avatar, a whole bunch of 3D TVs at CES and to go with that ESPN announcing a 3D channel (I thought there already was an ESPN 3?). It’s nice to know the option is there, and it’s good for kids stories and such, but I know I don’t plan on seeking it out. As well as getting a new look on the main mattclare.ca address in 2008 I typed a lot of words that made it to mattclare.ca. Here’s what they looked like in a Wordle word cloud. An of course this year I finally transitioned from making fun of Twitter to contributing to it, here’s what that looked like in what I tweeted and what was sent my way. You are currently browsing the iMatt :: The Blog of Matt Clare weblog archives for January, 2010 .